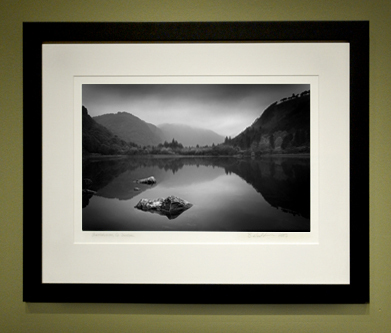 This framed Glendalough, Co. Wicklow shows our solid wood frames with a black matte finish. Every image is conservation matted and framed for utmost print archival quality. We are pleased to announce our on-line Store. Now it is easier than ever to select, order and purchase your own Fine Art Photograph. All photographs are individually printed on 100% acid free, cotton rag, fine art papers. Care and attention to material quality has been made to assure the life long enjoyment of these prints. The archival qualities of this fine print meet and exceed the life of traditional photographic materials. Every image is conservation mounted on museum board meeting the Library of Congress Standard for Conservation. Questions about the photos or not finding what you would like, just fill out the form here >. We are happy to help. Each limited edition print comes with an archival matte. The “Claddagh” image is only offered at one special size 10″ x 20″. For “Fires of Loss”, “Kilfenora Cross” and “Row Boats” images only. The framed Jerpoint Abbey and Stoned Fence 20″ x 26″ prints make a lovely pair against a gray wall. Shipping is additional. UPS rates determined by size and location. Free Local Minneapolis & Saint Paul delivery of framed photographs. Currently there are no original Barry Hendrickson signed prints, available for purchase.